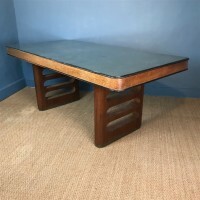 An Anglo Indian 2 tier Teak table chip carved in arts and crafts style circa 1900 in excellent solid condition. 22 inches square 24 inches high. 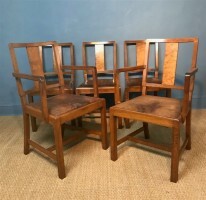 An English oak Art Deco side table circa 1925 with ebony octagonal bale handle. 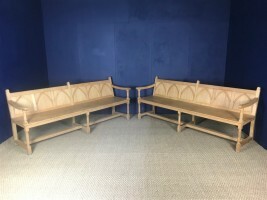 A pair of Arts and Crafts oak hall seats circa 1930 in Gothic style constructed from quarter sawn English oak. 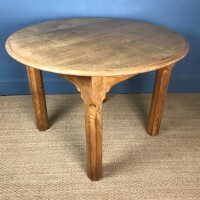 A Cotswold School oak circular table circa 1920 . 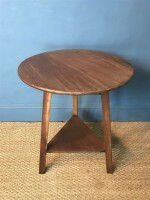 Read more: A Cotswold School oak circular table circa 1920 . 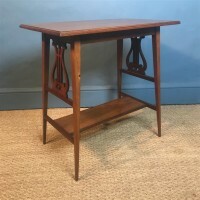 An Art Deco birds eye Maple and Rosewood and silvered glass topped table circa 1930 attributed to Betty Joel at the Token Workshops Portsmouth. 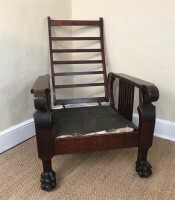 An unusual Arts and Crafts mahogany reclining armchair circa 1910. Read more: An unusual Arts and Crafts mahogany reclining armchair circa 1910.